Everyone is buzzing about the implications of Pacific Gas & Electric (PG&E) declaring bankruptcy. When the news broke last week, PG&E’s stock fell 52%, only to bounce back by 75% when California Department of Forestry and Fire Protection determined that private electrical equipment was responsible for starting the Tubbs Fire in Sonoma County in October 2017. The situation is volatile to say the least, and PG&E still faces a net $22 billion ($30B – $8B) in wildfire liability while only carrying $1.4 billion in insurance coverage. Understandably, many suspect a bailout in the making. While the bankruptcy news is certainly a serious matter, ratepayers should focus on the percentage of PG&E’s wildfire liability that may be assigned to them for recovery. 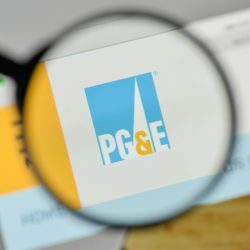 A proceeding with the California Public Utilities Commission has already been opened to determine PG&E’s ability to recover costs under Senate Bill 901. Although SB 901 allows for costs to be recovered if the utility acted diligently, public advocacy groups ought to monitor this proceeding as it develops to make sure PG&E shareholders shoulder the brunt of these costs to the extent the utility failed to adequately maintain and repair its distribution and transmission lines. The World Business Academy is one of these advocacy groups, and we will be keeping watch. Wildfire liability is also not limited to PG&E, as Southern California Edison (SCE) faces liability for its role in starting both the Thomas and Woolsey fires. This is reflected in SCE’s recent 8.7% drop in share price and downgrade to “underperform” this week from “neutral” by Bank of America Merrill Lynch. The downgrade notice cited the challenging environment in the Golden State and the open-ended nature of the wildfire liability risk. Of greater concern is that many “YieldCo” investments could take a huge hit should utilities be allowed to renegotiate older power purchase agreements (PPAs) that sell renewable energy at above current market prices. Developers who plowed the road to renewable energy should not be punished for their initiative, as they would likely get into the creditor queue and add cost premiums in future PPAs over the long term to make up for the shortfall. While many view the bankruptcy announcement with ominous portent, I see the development as a singular opportunity to clean the slate and reconsider the role of investor-owned utilities (IOUs) in our energy future. Until recently, utility companies had the field to themselves. They owned and operated generation plants, distribution and transmission wires, and through rate-based public funding, billed the ratepayer for it all plus a hefty “return on investment.” But the landscape has changed, and IOUs must contend with a growing community choice movement and solar+storage options that empower consumers to generate and store energy “behind the meter.” A utility’s failure to adapt to these trends could potentially result in its future irrelevance. This impending bankruptcy, combined with utility exposure to future wildfire liability, presents an opportunity to require IOUs to start dealing transparently with communities and ratepayers (i.e., you and me) to develop distributed energy solutions that provide both energy security and liability protection for everyone. Mandatory Coordination and Planning Role with Local Communities on Distributed Energy Resources (DERs). At the distribution level, energy must become part of the planning process and communities must have equal footing and a seat at the table in the decision-making process. Utilities must stop dictating to local governments and be more flexible and transparent in planning local DER development and design. Divestment of Transmission and Other Unessential Assets. PG&E should shed those assets that have created this mess. As noted by Craig Lewis of Clean Coalition during the Academy’s January 18th Solutions News broadcast, transmission assets of all utilities should be transferred to a state-run entity in charge of the entire grid. Two significant benefits from this approach: (i) reallocation of transmission costs to actual grid users in the form of a state-charged user fee and (ii) policies that replace transmission infrastructure with DERs in extreme fire hazard zones. Let’s not go there again. Transitioning from fossil fuels to a renewable energy economy is a transition from extracting stored energy in the ground to collecting and storing energy from our single largest energy resource: the Sun. Under this system, we all reap the benefits, and utilities are perfectly positioned to assume (and be compensated for) this important energy management role.